Over the last week, I’ve been playing with the idea of food FOMO. I have it. I’ve got food FOMO. I’ve been thinking about what it is, why I have it, what it means for me, and how to get rid of it. Then it occurred to me that food FOMO might just be another name for ‘total lack of self control when it comes to food’. Having said, that, I think perhaps it isn’t. I think food FOMO is it’s own thing. 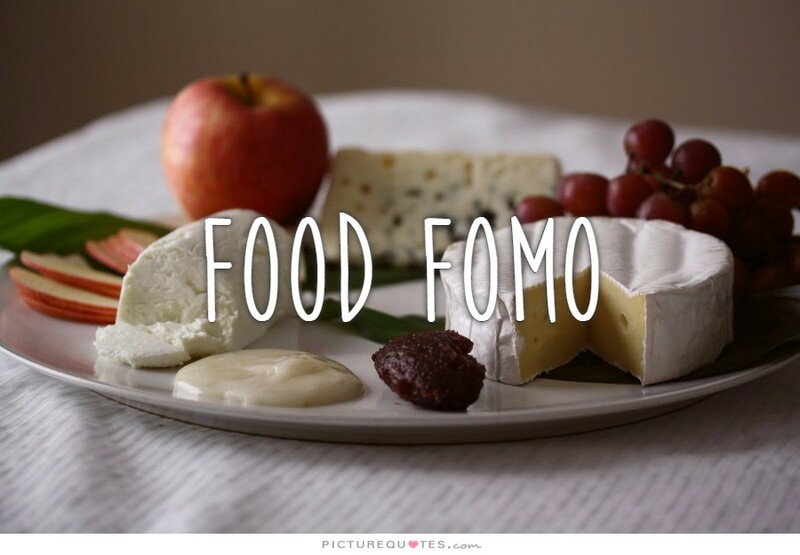 Food FOMO = fear of missing out on food. Sometimes it’s a fear of missing out because there’s finite food available in that circumstance. That’s the most obvious version of food FOMO, and I also think it’s the easiest to deal with. I think though there’s some deeper food FOMO happening, and it (probably) relates to how I’ve thought about food for a very long time. Now, it seems to have morphed into a thought process where I think “well I’m going to get my eating back in line really soon, so I should/can/want to eat X (x = cookie, cake, burger, chips, etc etc) because I’ll miss out on it soon”. Similarly, “well I wasn’t allowed to eat this growing up, and I’m an adult now, so I’ll just treat myself to this today”. Or, “that person drinks wine every night and they don’t carry extra weight, and I don’t drink much, so I can have wine too”. It’s funny, but I often have the conversation with myself that were I to give up the crap, and start committing to eating better quality food, I actually wouldn’t be missing out at all – I’d be gaining better taste, and most likely better health. But then, there’s that little chocolate bar that sits on my shoulder saying “but then you couldn’t eat me….” and the miniature packet of salt and vinegar chips that yells “me too”. And it’s not about junk food per se- it’s about refined carbs that I know make me feel lethargic and bloated, and sugar that makes my heart race, in plenty of forms. I’ve weaned myself off those things once, and I felt better, and I was enjoying the food and find there was plenty enough sugar in it without the extra added, and yet here I am having just eaten a cookie from a wrapper. I was going to write a very large blog about this, and try and make some resolutions or find actions or conclusions. But the reality is that I’m finding it incredibly hard and confronting to write. I’m feeling ashamed, pretty fat, lumpy, embarrassed, and not able to take action and make some change. I know it needs to come from me- I’ve seen enough people try and fail without their own motivation to know. I know it’s time to change, I know I’m risking an awful lot by staying like this… but here I am. Food FOMO is in full fling, and not sure what to do next.